(2 hours, minimum 5 children) and we'll do the rest! The children will enjoy creating their original design and painting their piece! Bring your own birthday cake, munchies and drinks. $18 per child -- choose from juice tumbler, plaque, pen holder, hot chocolate mug, trinket box, dessert plate and much more! 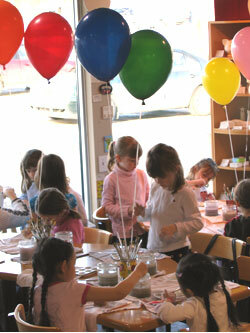 Call to book your child's birthday party!